Sexual behaviour Circling your feet, mounting and biting are signs of a sexually frustrated rabbit. Neutering will greatly help to reduce or eliminate this behaviour. Possessiveness Unneutered rabbits (especially females) can be very protective of their home, so it is best to clean their living area and refill the food dish when they are not around. Testing It is common for baby rabbits to try everything with their teeth. If your new bunny bites you, I suggest a small shriek to let him know it hurt. That is the sound rabbits make when they are in distress. Move over Rabbits will nip humans and other animals that are in their way. Just let out a short screech and avoid using your arm as a barrier to hold a rabbit in your lap. Misdirection You may get bitten when you intervene between fighting rabbits, or when you carry the scent of another rabbit on your clothes. Boredom/frustration Rabbits who don’t get enough exercise or stimulation (in the form of company, toys, a varied diet, etc.) may become aggressive and bad-tempered. Jealousy Take care not to neglect your bunny if you bring other animals into your home. Fear of heights or being dropped Most rabbits do not feel safe when they are lifted off the ground, and may kick and bite to get away. Zealous grooming When grooming each other, rabbits pull out foreign particles entangled in the other’s fur. Remember this when your rabbit licks your sleeve or trouser leg, and finds a seam or button that could be perceived as removable. Smelly fingers Don’t put your hand near your rabbit if you’ve been eating biscuits or slicing carrots. Always hold a treat in the palm of your hand, not between your fingers, when feeding your bunny. Rabbits have a blind spot in front of their noses, and may mistake your fingers for food. Fear/pain A rabbit may bite when he is ill or is being medicated. 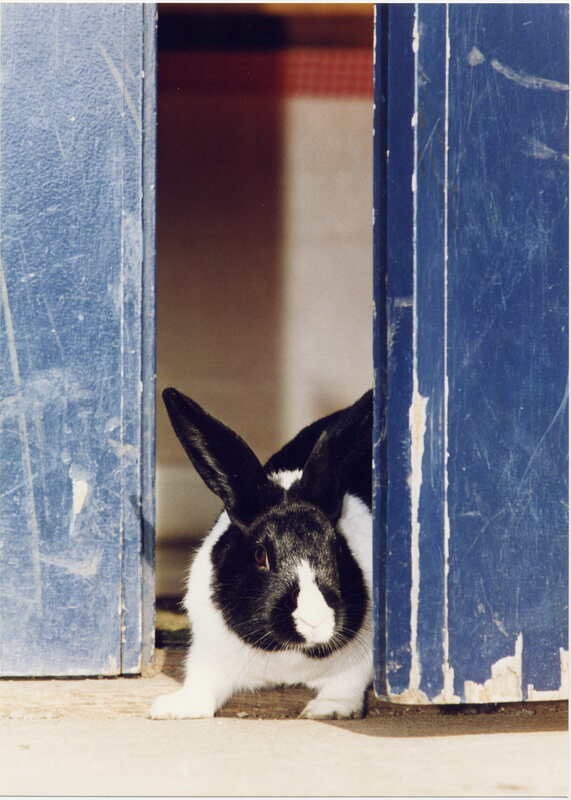 Defence Rabbits may feel threatened by objects coming from below eye level. Don’t put your hand in front of a rabbit’s nose to be sniffed or scratch a bunny under the chin. Always approach a bunny from the top rather than the front, especially a nervous or shy rabbit. Rabbits should never be chased or startled as they may bite in self-defence. Abuse from humans Rabbits who were mistreated in the past may become very aggressive towards people. The best way of dealing with these rabbits is to meet aggression with benevolence. Make sure you wear protective clothing (long sleeves, gloves, shoes, etc.) when you approach your bunny. Offer him his favourite food, petting and lots of praise. Eventually he will associate you with pleasant things, and will stop attacking you. Befriending an aggressive rabbit takes courage and patience, but is well worth the effort.